Have a hopping good time folding money rabbits. 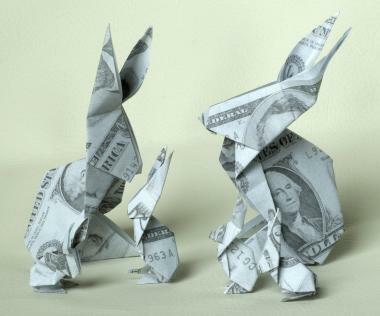 You'll never be embarrassed to give a dollar bill as a gift again after you learn how to fold a money origami rabbit. In Japan, money origami is known as Orikane. Dollar bill origami, moneygami and dollar bill folding are all euphemisms for Orikane, considered an ancient art that was once reserved exclusively for the wealthy and elite. Centuries ago, Orikane was only practiced by a chosen few as it involved the best and most technical origami folds. In ancient Japan, Orikane was used to create awe-inspiring objects from the world's most expensive bills. Today, Orikane instructions are widely available, which means even the most craft-challenged among us can easily create stunning works of art from ordinary dollar bills. Place the dollar bill vertically, face-side up on a hard, flat surface. Fold the top right corner of the dollar bill diagonally down to the opposite side. Open bill flat and repeat with the left top corner. Open the bill flat. There should be two creases on the top of your dollar bill that form an "X." Bend the dollar bill backwards through the middle of the X. Push on the middle of the bend with your finger. Collapse the folds on the pre-made creases by pushing the sides in, and the top down. Your dollar bill should look like a house. Fold the two sides of the "house" inward, so that they meet in the center. If you do this correctly, the sides will fit under the points of the triangle on top. (It's fine to leave a small space in between the edges.) When you are done the "house" should look like an arrow. Fold the elongated bottom part almost all the way up to the top. Make sure the point of the "arrow" is still showing. Take a little more than half of the bottom part, and fold it down. Turn the dollar bill over again. Fold both points of the triangle to the center. Bend the points back part way to make ears. To make your bunny hop, push down lightly on the space behind his ears, then release. In addition to the aforementioned directions on folding a money origami rabbit, there are a host of other resources that will help you create money bunnies. When creating origami objects from dollar bills it's important to firmly press all creases. Doing so will help your object maintain its integrity. Dollar bills are made from fabric, which doesn't hold a fold as well as traditional paper; so firm creases are a must. Another way to ensure your Orikane creation comes out looking like life-like is to use new dollar bills. Clean, crisp bills are easier to work with and yield better results. Finally, once you learn how to fold a money origami rabbit, or other Orikane creations you can give them away as gifts. Better yet, surprise the wait staff at your favorite restaurant by leaving a family of origami bunnies made from dollar bills.